The Wanderlust Speakeasy podcast brings our signature lecture series straight to your ears, whether you’re listening at home, in the car, at work, or anywhere else life takes you. Our first season, hosted by Wanderlust co-founder Jeff Krasno, focuses on what it means to live a spiritual life. We’ll hear from a inspiring lineup of Wanderlust’s presenters, including prominent yoga teachers, wellness leaders, authors, musicians, and more. Want more Speakeasy? Check out the video series on Wanderlust TV! Thank you for joining us in for Season 3 as we examined Practice. In Season 4, we’ll be looking at Intimacy. We can’t wait. Season 3 starts 1/4. How can we can bring light – to ourselves and others – through our practice, our work, our interactions? By articulating and loving the darkest aspects of ourselves. Elena shares her experience of her own discoveries of light, via the dark knots of fear that dim our light and rob us of precious energy. Elena shares her studies and ways in which we can all articulate and literally love what we’d rather hide, thereby bringing light to every realm of your life. “Your goals, dreams and aspirations: if you’re not achieving them, then at some level they are connected to a fight or flight response.” Hear the fascinating theory behind how tapping works from Nick Ortner, who breaks it down for the Wanderlust Speakeasy crowd with a sense of humour and compassion. Chris Grosso knows firsthand what the cyclical nature of sadness, pain, and despair feels like. A former addict, Chris shares how he found spiritual growth when he was at his most vulnerable in this Speakeasy talk from Wanderlust Stratton 2014. Finding our true spirit, he says, depends a lot on our own unique experiences. But acknowledging both our relative, physical self and our ultimate self can get us there. Dr. Aviva Romm talks about the relationship between women, their bodies, and the earth in this Speakeasy talk from Wanderlust Stratton 2014. She shares stories of women she’s encountered throughout her work as a midwife, clinical herbalist, and physician that have felt the influence of the outside world on their inner health, whether it’s interpersonal relationships, stress, or the foods they’re eating. We’re getting mixed messages from society about what is and isn’t normal, and what we are and are not capable of, as women. We can take back control. Rod Stryker is the founder of ParaYoga and the author of The Four Desires: Creating a Life of Purpose, Happiness, Prosperity, and Freedom. Rod is widely recognized as one of the West’s leading authorities on yoga, Tantra, and meditation. His teaching weaves a profound breadth of knowledge and experience, along with his unique ability to make the deepest of the ancient teachings accessible to students of all levels. Rod has taught for more than 30 years and leads retreats, workshops, and ParaYoga Master trainings worldwide. Shiva Rea, M.A. is a yogini firekeeper, sacred activist, global adventurer and leading innovator in the evolution of prana flow yoga, transformational vinyasa flow integrating the tantric bhakti roots of yoga, Krishnamacharya’s teachings and a universal, quantum approach to the body. Shiva is known for bringing the roots of yoga alive for modern practitioners in creative, dynamic and life-transforming ways and for offering the synthesis form of prana flow out in the world. Shiva is the creator of Prana Flow Yoga, Yogadventure Retreats, Yoga Trance Dance for Life, Moving Activism for 1,008,000 Trees, the worldwide Global Mala Project, Yogini Conferences and E2: The Evolutionary Edge Tour. She writes for Yoga Journal, Yoga Plus Joyful Living, is the author of award-winning CD’s and DVD’s, and contributor to many publications and features. Meditation is much more than just a way to relieve stress. When approached properly, it sends you on an express elevator to your life’s purpose. This speakeasy will teach you about Active Meditation and give you tangible takeaways that you can use right away to next-level your life, unlock your creativity, and ignite your passion. Gabrielle Bernstein believes that simple, consistent shifts in our thinking and actions can lead to the miraculous in all aspects of our daily lives, including our relationships, finances, bodies and self-image. In this inspiring workshop, Gabrielle will offer an exciting plan for releasing fear and allowing gratitude, forgiveness and love to flow through us without fail. All of which, ultimately, will lead to breathtaking lives of abundance, acceptance, appreciation and happiness. Attend the May Cause Miracles talk and you can expect incredible transformation as you are guided to make subtle shifts that add up to create miraculous change. 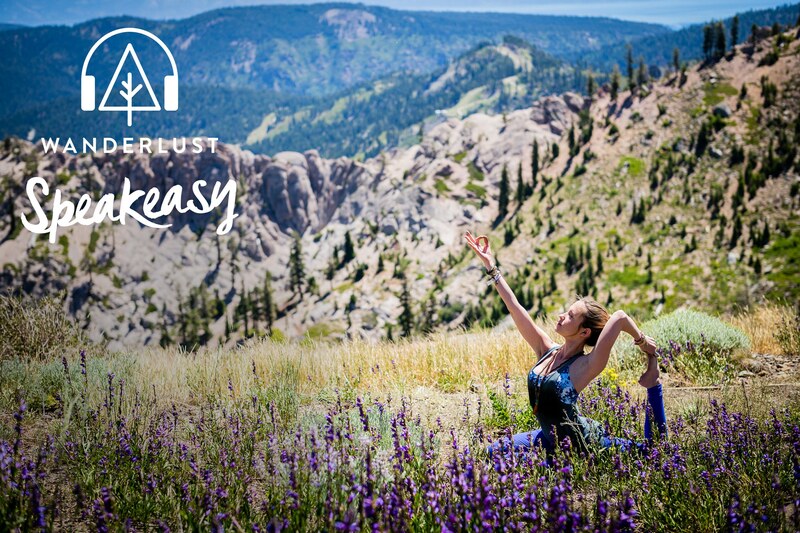 Maty Ezraty joins us in Lake Tahoe, CA to discuss the business side of yoga — she shares tips on opening a studio, keeping it vibrant, how to keep your teachers and students engaged, and more. Maty Ezraty was the original founder of Yoga Works in Santa Monica California and directed the Teacher Training Program there for over 16 years. She has studied with Sri K. Pattabhi Jois 5 times in India , and during 5 of his American tours as well as once in France .She is known for her joyful, engaging and determined approach to teaching correct form. Teaching since 1985 Maty has been a student of many senior Iyengar teachers which reflects in her practice and how she teaches. From Wanderlust Speakeasy Lake Tahoe 2011. Olympian Gretchen Bleiler learned how to tap into flow state during her experience at the X Games in Aspen, Colorado. Bleiler taught herself how to tap into flow state, or what she calls our own human potential. She believes we are able to tap into it at any time; all we have to do is learn how. Every persons’ flow state is unique and different, depending on our own abilities and willingness to explore it. Once we can tap into flow state, all effort ceases—as it did for Bleiler in her X Games run—and things become easeful. From Wanderlust Aspen Snowmass 2015. In this Speakeasy, “Living Truth: Where Yoga Meets Modern Psychology,” Ashley Turner explores the psychological effects of yoga and how the psychology and yoga converge. In this insightful talk from Wanderlust’s Speakeasy, Sri Dharma Mittra explains the root of yoga: Yama. Without Yama there is no yoga, it is the first step in the journey of knowing. But what exactly is Yama? Defined as the ethical precepts set forth in the yoga sutras, is encompasses the first and second set of the eight limbs that form the foundation for spiritual progress along the path to enlightenment. Through stories and personal experience Sri Dharma Mittra explains how a life based on this foundational limb of yoga, Yama, that encompasses compassion, truthfulness, non-stealing, moderation and non-hoarding can help you achieve a more successful life and a deeper understanding in your practice. From Wanderlust Tremblant 2015. Thank you for joining us for Season 2 as we examined Food. In Season 3, we’ll be looking at Practice. We can’t wait. Season 3 starts 9/7. “The fundamental problem is that we’re treating 21st century diseases—lifestyle-related diseases—with drugs instead of things like diet and yoga. We need to rethink our whole approach.” We’re facing some pretty challenging health issues in America. In this Speakeasy talk, Dr. Mark Hyman discusses how we can get to the root of chronic diseases like obesity and diabetes by treating food as medicine. From Wanderlust Copper Mountain 2013. Moby headlined the 2010 Lake Tahoe festival, playing a DJ set to the Squaw Valley crowd. Moby has toured extensively, playing well over 3,000 concerts in his career, and his music has appeared in hundreds of different films, including ‘Heat’, Any Given Sunday’, ‘Tomorrow Never Dies’, and ‘The Beach’, among others. Moby supports many non-profit entities, such as the Humane Society and the Institute for Music & Neurologic function. He also recently edited a book entitled “Gristle: From Factory Farms to Food Safety (Thinking Twice About the Meat We Eat)”. From Wanderlust Squaw Valley 2010. Though it’s one of the richest nations in the world, the United States has become synonymous with unhealthy eating and obesity. In this talk from Wanderlust’s Speakeasy, Jenny McGruther, real food advocate and author of Nourished Kitchen, explores our country’s difficult relationship with food and how we got to now. Generations ago, new immigrants brought with them traditions of seasonal eating, fermentation, and farm-fresh produce. As time went on, industrialization and war necessitated the use of prepackaged foods for soldiers and trade purposes. Yet after the war ended, these prepackaged foods continued to be celebrated for their convenience and modernity. From-scratch cooking unfortunately fell out of fashion. Now in the present day, we are confronted with the fact that fresh, live, and local will always be the healthiest choice. Jennifer McGruther has made it her mission to bring real food to the masses. After realizing her town lacked a farmers market, she and her husband united local families and the surrounding communities to create one.From Wanderlust Squaw Valley 2015. After graduating from the University of North Carolina — to the delight of his loving family – Kevin parlayed his academic achievements into washing dishes. Professionally. After ten years of working in every possible position in the restaurant industry, Kevin launched Acme Food & Beverage Co. in Carrboro. Since that time, Acme has been featured in Bon Appetit, Southern Living, Garden & Gun, The New York Times, Esquire, and many other national and regional newspapers and magazines. Kevin is one of the nation’s leading advocates of sustainable food and local farms. His work maintains deep connections to the traditional foodways at the heart of the honest food of the American South. In 2016, Kevin was named by Lululemon as one of their 29 American artists and taste ‘makers,’ and in 2017 was chosen to be a Lululemon Ambassador. For the second year in a row, Kevin has been named the Executive Chef of the Wanderlust Festivals. This year will also mark the opening of his second restaurant. The father of two oh-so-awesome young women, Kevin lives in Carrboro, North Carolina. From Wanderlust Stratton 2016. Jason Wrobel is a world-renowned leader in organic raw vegan cuisine, culinary education and epicurean entertainment. With a focus on radical simplicity and artful presentation, he imbues his ecstatic raw food creations with the energy of fresh, local, organic produce and the healing properties of raw superfoods, which have rendered his dishes hands-down favorites among celebrity clients, and regular folk alike. J-Wro fans Woody Harrelson, Jeremy Piven, Robin Wright, Sigourney Weaver, John C. Reilly, Steve Buscemi, Isabelle Adjani, Oren Moverman and Russell Simmons, consistently (and effusively) rave about his healthy, innovative and delicious plant-based creations. From Squaw Valley 2016. Gene Baur has been hailed as “the conscience of the food movement” by Time magazine. For more than 25 years he has traveled extensively around the country, campaigning to raise awareness about the abuses of industrialized factory farming and our current food system. From Wanderlust Tremblant 2015. Seamus Mullen is an award-winning New York chef, restaurateur and cookbook author known for his inventive yet approachable Spanish cuisine, and a leading authority on health and wellness. Seamus opened his first solo restaurant Tertulia in Manhattan in 2011, which was awarded two stars from The New York Times and a finalist for the James Beard Foundation Award for Best New Restaurant. In 2013, he opened El Colmado, a Spanish tapas and wine bar at Gotham West Market, a food hall in New York’s Hell’s Kitchen. In this episode he talks about the healing power of food at Wanderlust Squaw Valley 2015. In this talk from Wanderlust’s Speakeasy, clinical and holistic nutritionist Christa Orecchio explains the role the human microbiome plays in our overall wellness. In America we have over 64 million people currently struggling with digestive health. From Crohns to colitis, IBD and other gut disorders, our overuse of antibiotics, elevated stress levels and unhealthy eating patterns have led us down a path of compromised immunity.Through her practice of natural medicine, Christa explains the importance of finding the root of disease and learning to treat the cause instead of just the symptoms. In this talk we will learn how to heal our gut microbiome and retrain our bodies to understand the process of replicating health throughout our entire system. From Wanderlust Squaw Valley 2015. The New York Times says he’s “Virginia’s most multifaceted agrarian since Thomas Jefferson [and] the high priest of the pasture”; Salatin calls himself a environmentalist capitalist lunatic farmer, and we call him a heck of a good time! We were thrilled to have this outspoken and animated pioneer in beyond-organic farming visit us at Wanderlust Vermont in Stratton, VT in June of 2012. Thank you for joining us for the first season of the Wanderlust Speakeasy Podcast. We’ll be back on May 18th with our second season, Food. The food we eat directly impacts our bodies, the economy, and the planet. In this season, you’ll learn the ins and outs of the modern food industry, from “beyond organic” farming to fermentation basics. Speakers include Joel Salatin, Christa Orecchio, Dr. Mark Hyman, and more. Until then, please remember to subscribe, leave us a review, or share the podcast with your friends. And as always, thank you for listening. Meditation teacher and award-winning author Lodro Rinzler spoke at Wanderlust Aspen-Snowmass on how we can apply our meditation practice not only to our own lives, but to our relationships with our friends, families, and society as a whole. Richard Melville Hall, better known by his stage name Moby, is an American DJ, singer, songwriter, musician, photographer and animal rights activist. In this talk he explains how we can take encounters with the divine out of churches and temples and into nature and the universe. From Wanderlust Aspen-Snowmass 2015. Sage Rountree is an internationally recognized authority in yoga for athletes and an endurance sports coach specializing in athletic recovery. In this talk, Sage helps us dig deeper, and helps us understand how goals and intentions can be like anchors in our life to help us “master the moment.” From Wanderlust Snowshoe 2015. Kate Northrup is a professional freedom seeker and creative entrepreneur. She created financial freedom for herself at the age of 28 through building a team of more than 3,000 wellness entrepreneurs in the network marketing industry. Her philosophy is that if you free yourself financially you can be fully present to your purpose on the planet. In this lecture she shares her personal struggle with finances, how she finally paid off her debts, and tips on how to achieve financial freedom and happiness. From Wanderlust Whistler 2012. Faith Hunter is a yoga teacher and lifestylist, founder and creator of Spiritually Fly. In this lecture she helps let down the walls, face your demons, step into honesty, follow your passions, trust and have faith, lead with love, and re-chart your life guided by your divine inner power. From Wanderlust Snowshoe 2015. Aimee Raupp, accomplished author and women’s health expert, leads us in a discussion that explores the connection between love and healthy sexuality. She explains how spirituality—however it is we choose to define it—touches these concepts in profound ways. From Wanderlust Snowshoe 2015. Marianne Williamson is an internationally acclaimed author and spiritual teacher. She explains how allowing our individual practice to become bigger than our bodies can create a more just and compassionate world. Her message is more potent now than ever before. From Whistler 2012. Noah Levine, a Buddhist teacher and author, explores how sexuality is a sacred source of both joy and sorrow, and how mindfulness can balance our need for intimacy as humans. His fascinating talk touches on enlightenment, attachment theory, and human connection, explaining how the underlying principles of Buddhism touch all three. From Aspen-Snowmass 2015. Ceremony is one of the greatest tools we have to connect to our own spirit. And although we may not notice them, ceremonies and rituals pop up in everything we do, from our morning routines, to our yoga practice, to our meals. In this talk, Ana Forrest shares some of the ceremonies that she has learned and created, and how these practices can help us heal. From Squaw Valley 2015. Sometimes it feels very easy to slip into the void of negative thinking. In this talk, Gabby Bernstein shows us how to right the ship and step back into the light. Her stories are at once deeply personal and universal in their depiction of the human experience. From Squaw Valley 2014. In this meditative narrative, yoga teacher, author, and speaker Elena Brower takes a candid look at how hidden habits can quietly wreak havoc on our lives. Elena confesses her struggles with addiction and sheds light on how with the support of colleagues, friends, science, and daily practice we can shift our minds, our bodies, and our hearts from a state of sabotage to a space of love and listening. From Aspen–Snowmass 2015. Internationally celebrated yoga teacher Seane Corn shares her perspective on the unsustainable side of activism: that too often we’re shouting at each other and not really listening. She explains how we can turn to conscious activism by using the tools of yoga and mindfulness. From Squaw Valley 2015. Wayne Dyer takes us on a voyage of discovery through the powers of manifestation. He discusses techniques for reaching a higher plane of existence, understanding the importance of self-actualization, and becoming our best selves. From Squaw Valley 2012. We’re launching soon! In the meantime, give our trailer a listen and subscribe to the Wanderlust Speakeasy on iTunes. Once you’re subscribed, the first episode will download automatically as soon as it’s released.